The Buddy™ Arc 180 is a robust and durable power source for the professional welder. The machine provides state-of-the-art welding performance and reliability through use of the latest high grade IGBT technology. Practical design – Equipped with both a shoulder strap and a robust handle making it easy to carry. 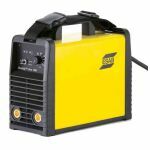 The Buddy™ Arc 180 is a user friendly, robust and light weight stick (MMA) welding machine which also features a Live TIG arc mode. The internal electronics are cooled by a highly efficient fan for added reliability and monitored by a thermal protection system. The machine has been equipped with three heat sinks which further extend the life time of the product. The casing has been designed to withstand harsh environments and is rated to IP 23S standard. The machine incorporates both a shoulder strap and a robust carry handle. Buddy™ Arc 180 provides a smooth DC (Direct Current) welding power which allows you to weld most metals such as alloyed and non alloyed steel, stainless steel and cast iron. The arc force and hot start settings are adjusted automatically according to the set welding current giving excellent arc starts and welding performance across the amperage range of the machine. The Buddy™ Arc 180 can weld most electrodes from Ø1.6 -3.2 mm. The Buddy™ Arc 180 can easily perform TIG-welding using a “Live Tig” start. Equip the power source with the optional Tig-Torch which has an in-built gas valve, a gas regulator and a bottle of gas and you are ready to weld mild steel or stainless steel with or without filler material.